Decades of overpumping have left many groundwater basins throughout California depleted. The finding comes in “An Evaluation of California’s Adjudicated Groundwater Basins” scheduled for release today (Feb. 18). The board contracted with Ruth Langridge, a UC Santa Cruz researcher with the Center for Global, International and Regional Studies, to review the history, development, overall condition and current management practices for all of California’s court-adjudicated groundwater basins. The research team that created the report also includes UC Santa Cruz sociology Ph.D. students Abigail Brown and Kirsten Rudestam, and Esther Conrad, a recent Ph.D. graduate of UC Berkeley. 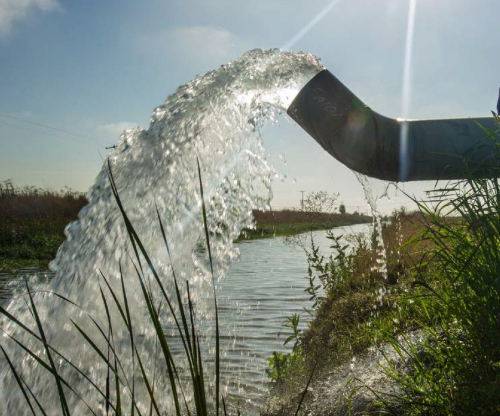 Groundwater is a critical resource in California, providing on average 30 percent of the state’s total water supply and significantly more during dry years. The report and its conclusions are significant as the state water board considers management plans for groundwater supplies depleted after decades of pumping and four years of drought. Land in some Central Valley regions has sunk because of groundwater depletion. In other areas closer to the coast, salt water has intruded as fresh water is pumped from groundwater basins. The issue is also significant as water agencies increasing look to import water to supplement depleted supply. “It is at the forefront because imported water is becoming more scarce and more expensive,” Langridge said. In 2014, the state’s Sustainable Groundwater Management Act (SGMA) established new requirements to develop sustainable management plans with state oversight for 127 high- and medium-priority groundwater basins that are either in overdraft or vulnerable to overdraft. It exempted all “adjudicated” basins in the state along with three others with pending groundwater adjudications, and 388 basins categorized as low- and very-low priority. In a groundwater adjudication, a court defines and determines water rights for all water users in the basin and provides court-supervised basin management by a “watermaster,” usually someone appointed by the court to ensure that the basin is managed in accordance with the court’s decree. Langridge said the adjudicated basins her team studied encompass most of the major Southern California urban areas as well as important Central Coast areas. “Despite the state's concern over its groundwater resources, there is very limited research on these basins and almost nothing over the past several decades,” Langridge said. Langridge said adjudication is primarily about the needs and interests of individual parties, as opposed to focusing on overall sustainable management of the basin. She and her team found that declining groundwater levels and associated impacts were a primary problem leading to adjudication, but not the only problem. Groundwater pumping is generally based on past practices, and there is a major reliance on imported water without consideration of the impacts of climate change, the team found. Significantly, Langridge said, small users and disadvantaged communities are rarely included. Safe yield is neither calculated nor used in some basins and accumulated overdraft is rarely addressed. The report recommends requirements for the sustainable management of adjudicated groundwater basins, including a watermaster and required annual reports, clear definitions and specifications of safe yield and overdraft, procedures to reduce pumping, strategies to reduce accumulated overdraft, and trigger points to spur further action. Langridge’s research focuses on the processes and relations that enable access to water and create resilience to water scarcity; the legal and institutional issues related to water supply planning and groundwater management; and water supply security under climate change. She recently completed a three-year term as a member of the California Department of Water Resources Climate Change Technical Advisory Committee. Langridge said the data she and her colleagues collected over the past nine months will now allow further analysis of California’s precarious water future.